The Clash is no stranger to having its albums reissued, repackaged, and repurposed, so it's inevitable that the band is finally getting the box set treatment. 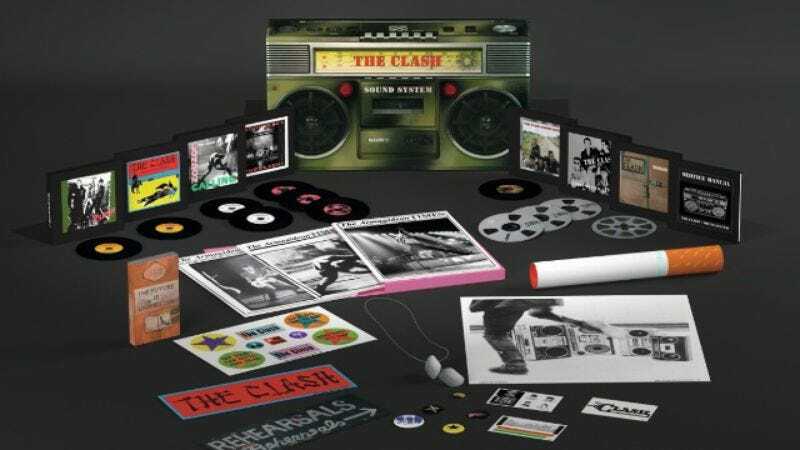 Housed inside a boombox-shaped box, Sound System will compile the band's seminal albums on CD with three discs of B-sides and outtakes, a DVD, and various pieces of Clash regalia such as a poster and dog tags. The albums are remastered for the ump-teenth time, but this go-round sees band member Mick Jones taking on the job. In tandem with the Sound System box the group will also be releasing The Clash - Hits Back, a 2-CD/3-LP affair that strips down the box to its bare essentials as well as The Clash Five Studio-Album Set which will be available on both CD and LP, all of which will be available on September 10. Not surprisingly the band's final album—the one that saw Joe Strummer firing everyone and essentially going solo under the Clash moniker—Cut The Crap is omitted from every version of the set, because if we all stop talking about it then it's like it never happened in the first place.